 A very impessive sign-off clip which commences with vintage clips of 1950s-era NBC programming, followed by clips of WIRI-WPTZ shows of the past, which included Chiller Theatre (Saturday night horror movies) and Actionland 5 (teenage dance party). Also seen are variations of the classic NBC-TV Peacock logo. Speaking of which, in a couple of scenes there's a Channel 5 staffer dressed in an NBC Peacock suit with a big numeral "5" on its chest (which brings up this question: is the NBC Peacock male or female?). The video wraps up with the playing of Kate Smith's classic rendition of "God Bless America". Channel 5 first signed on as WIRI in December 1954 as a primary affiliate of the NBC Television Network, which it remains to the present day. New ownership of Channel 5 in 1956 had the callsign changed to the present WPTZ, the final three letters standing for PlatTZburgh (sic). The WPTZ calls had been dropped by Philadelphia's Channel 3 (now KYW-TV), which had been acquired by NBC from Westinghouse in a highly controversial deal early in 1956 (Channel 3 is now O&Oed by CBS).